The festival aims to break the perception that comics are for children and about superheroes only. Born out of a conversation about Comiket, the world’s largest comics festival held in Japan, the Indie Comix Fest (ICF) is set to host its first event in Pune this weekend. Bharath Murthy, comic book artist and publisher, and writer Aniceto Pereira saw the need for a self-publishing shared platform like Comiket in India and roped in their friends, book publishers Kailash Iyer and Chaitanya Modak, to help them organise the first Indie Comix Fest in Mumbai in October 2017. Their motto was “more comics and better comics”. “When one uses the term ‘comics’, the immediate perception is of something related to children, superheroes or mythology. It is to break out of these norms that we came together to organise the Indie Comix Fest, the first step in creating a forum that brings together comic creators and readers to share and showcase comics as a genuine form of cultural expression,”says Modak, organiser of ICF. ICF, a non-profit event, provides a platform for self-published artists and an opportunity for readers to discover fresh content, original voices and authentic local stories. “There is a need for an ecosystem that celebrates strong and original content that uses words and pictures to create powerful and compelling narratives. We have been organically growing every season. We all have day jobs, and self-published comics have always been labours of love. We work within a limited budget and raise money through sponsors. As for the creators, they need a space to share new works, meet new readers, gather feedback, and commune with others comic creators. 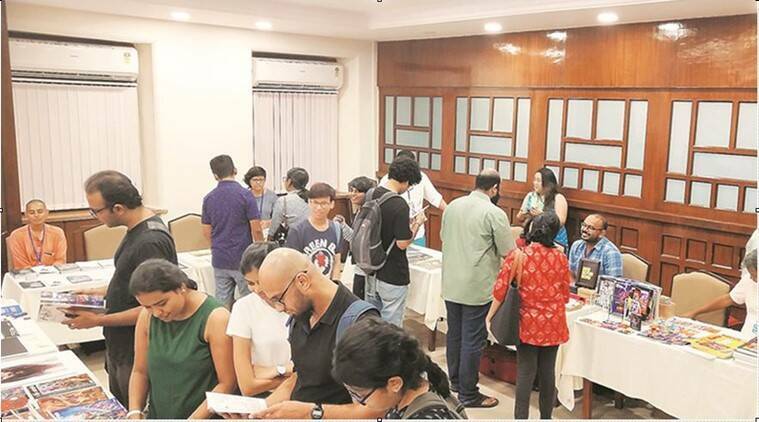 If a creator is going to meet a reader, you would find it easier to do so in a space far away from a merchandise-driven flea-market atmosphere,”says Murthy. The ICF is held twice a year. This year Pune, Kochi, Goa and Kolkata have been added as venues for the fest’s third edition. Modak, who started out by drawing a comic strip, Bhopu, for Loksatta in Pune says, “We felt that we needed to expand the fest to places where comics exist as a culture in local languages, like in Marathi, Malayali and Bengali. Pune, especially, has a history of comic and cartoon creators. Stalwarts such as Mangesh Tendulkar, S D Phadnis, even R K Laxman have lived and worked here. It has numerous publishing houses, newspapers and diwaliankas with their own home-grown comic strips and cartoonists.” The fest will feature anthologies, serialised floppies, hand-pressed zines, fold-out comics, screen printed comics, posters, and workshops on how to make comics. Talking about how social media affects artists, Modak says, “Social media is a fantastic mode of reaching wider audiences across geographies. As comics junkies, one is introduced to a range of artists working across a variety of styles and genres. There are comic makers on Instagram with several lakhs of followers. No one can escape comics any more.” Samidha Gunjal, an illustrator and animator, says, “I use social media to share artworks and love sharing tips, hacks and processes with my followers. Feedback from my followers is very important for me in order to improve my skills.” Gunjal, who is participating in the fest for the first time, is looking forward to meeting fellow comic enthusiasts. “I am very excited about the fest. I will be showcasing and selling my first self-published comic zines along with some merchandise based on the same stories,” says Gunjal.